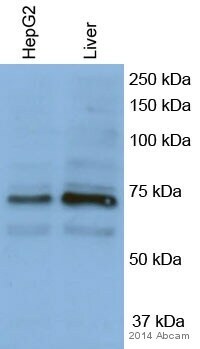 Rabbit polyclonal MMP2 antibody. Validated in WB, IHC, ICC/IF and tested in Mouse, Rat, Chicken, Human. Cited in 155 publication(s). Independently reviewed in 17 review(s). 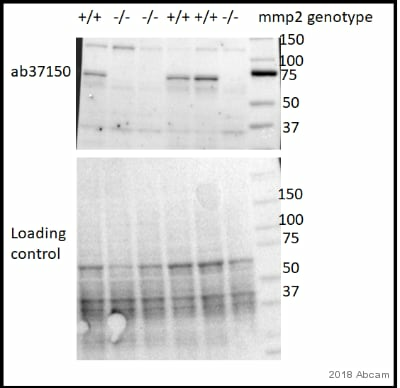 This antibody is specific for pro and activated forms of MMP2. It does not react with other MMPs tested. Synthetic peptide corresponding to Human MMP2 aa 475-490. Our Abpromise guarantee covers the use of ab37150 in the following tested applications. WB Use a concentration of 0.5 - 2 µg/ml. Detects a band of approximately 72 kDa (predicted molecular weight: 72 kDa). IHC-Fr Use a concentration of 2 - 4 µg/ml. Detection of MMP2 in a paraffin-embedded human neurofibroma section stained with ab37150 at 2µg/ml. No antigen retrieval was carried out. Detection of MMP2 in a frozen injured rat nerve tissue section stained using ab37150 at 2µg/ml. ab37150 staining MMP2 in Rat fibroblast cells by Immunocytochemistry/ Immunofluorescence. 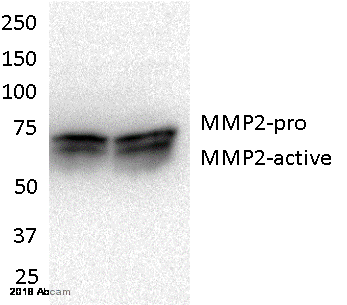 The cells were paraformaldehyde fixed and then blocked using 1% BSA for 1 hour at 25°C. Samples were then incubated with primary antibody at 1/200 for 16 hours at 4°C. 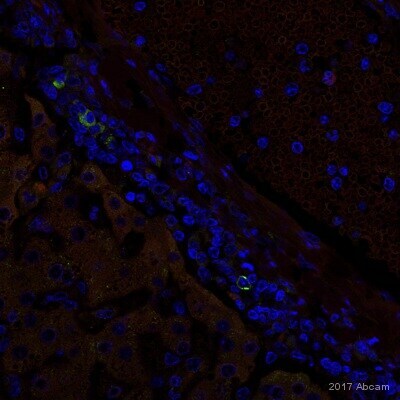 The secondary antibody used was a goat anti-rabbit IgG conjugated to Alexa Fluor® 488 (green) (ab150077) used at a 1/1000 dilution.Cells were stimulated with PDBu. Publishing research using ab37150? Please let us know so that we can cite the reference in this datasheet.